Updated 1 p.m. Eastern with press conference comments. LAUREL, Md. — NASA’s New Horizons completed a close approach to a small body in the distant Kuiper Belt early Jan. 1, collecting data that may reveal new insights about the formation of the solar system. New Horizons made its closest approach to 2014 MU69, also known as Ultima Thule, at 12:33 a.m. Eastern, passing approximately 3,500 kilometers from the Kuiper Belt object. While the approach was celebrated at the time during an event at the Johns Hopkins University Applied Physics Laboratory (APL) here, the spacecraft was not in communications with the Earth. NASA’s Deep Space Network received a signal from the spacecraft at 10:29 a.m. Eastern. That initial transmission contained no science data but rather telemetry about the health of the spacecraft and its performance during the flyby, including how much data it collected. Future downlinks, including one scheduled for later Jan. 1, will start returning science data. While the signal contained no science data, project scientists did release some findings from data collected prior to closest approach and transmitted to Earth Dec. 31. That includes a better image of Ultima Thule, which appears similar in shape to a peanut or bowling pin, about 35 kilometers long and 15 kilometers wide. 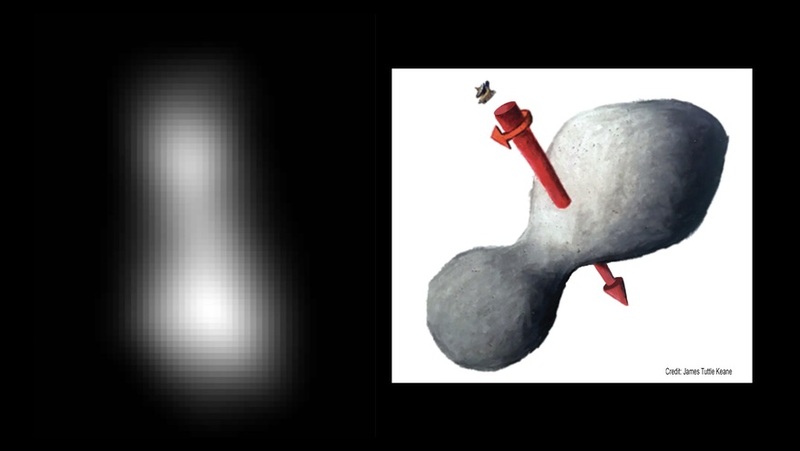 Stern said scientists can’t rule out that Ultima Thule is a binary object, with two bodies orbiting very close to each other, but believe it’s more likely it is a single body with two distinct lobes. What’s not yet clear, he added, is the rotation rate of the object. The observations so far can be explained by rotation periods of 15 and 30 hours, but upcoming data should resolve that difference. It will take about 20 months for New Horizons to transmit the estimated seven gigabytes of data it collected during the flyby. The next few days will see some high-resolution images, Stern said, although the sharpest images — with an estimated resolution as good as 33 meters per pixel — won’t come down until February. Some initial spectral data will also be returned this week. 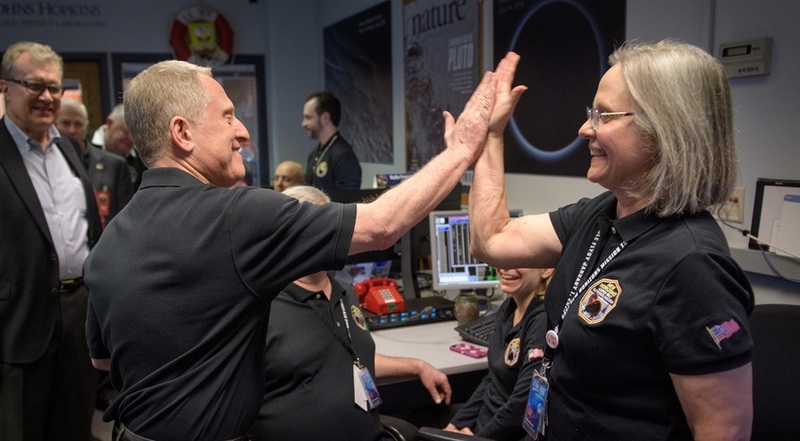 The science team will work with those data this week, then take a break next week when the spacecraft is in solar conjunction, with the sun blocking communications with the spacecraft. The science team will reconvene around Jan. 15, Stern said, after communications resume. What makes Ultima Thule interesting to scientists is that is part of a population of “cold classical” Kuiper Belt objects whose orbits, with low inclinations and eccentricities, suggest that they are pristine objects unaltered since the formation of the solar system 4.6 billion years ago.